1. Prepared veggies and place in large bowl. it too hot, use red jalapenos instead, they are much milder. 3. 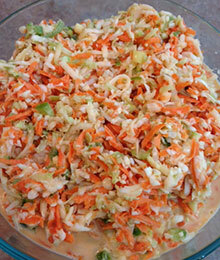 Pour dressing on shredded vegetables and toss until well mixed. Adjust quantities according to taste. 4. Let flavors marinate in refrigerator for at least 2 hours.